Increasing demand for premium vehicle and increasing stringent vehicle safety standard is one of the prime trends influencing growth of the global automotive rare view mirror market. The projected demand for commercialization and development of fully automatic vehicle is likely to offer immense opportunity for the growth of this market in the coming years. The rising safety and growing accident concern is one other factor responsible for the global market growth. The largest headrest at the backseat of vehicle have led to decreased the visibility in the traditional rare view mirror and therefore this force the manufacturers to implement smart rare view mirror that provides better visibility to the driver with intended functions and benefits. In addition, these automotive rare view mirrors have full screen clear view monitor for better visibility and the mirror are positioned within the existing mirror. Also, the mirror has potential to switch between two modes that is camera and mirror. These facilities are very helpful in providing better understanding of traffic behind the vehicle and this is one of the prime factors triggering automotive rare view mirror market growth in the coming years. Furthermore surge in demand for the automatic vehicles and advancement in technology and increase in demand for high end and middle segment are some of the trend positively supporting growth of this market in the year to come. 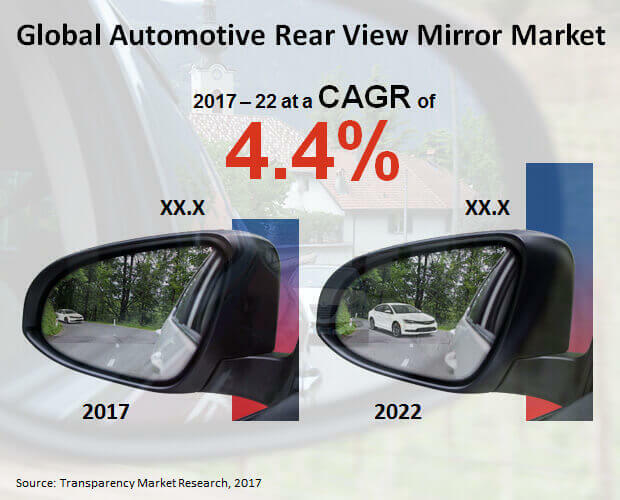 The global automotive rare view mirror market is projected to register tremendous growth is likely to fuel demand for the global automotive rare view mirror market. The market is likely to register robust CAGR of 5.06% during the course of forecast period from 2018 till 2022. On the other hand, technology advancement playing significant role in upcoming vehicle, as concepts car are designed with advanced camera installed in the vehicles. In addition, camera possesses advantage over the automotive rare view mirror and this improves safety. This is likely to hamper growth of the automotive rare view mirror market in the coming years. However, the electronic rare view is replacing the traditional rare view market in the electronic display and camera and this is driving market growth. From the geographical point of view, Asia Pacific is likely to dominate global automotive rare view mirror market. This is owing to rising production of vehicle in the India, Japan and China. In addition, this is also the fastest growing market in the Asia Pacific region. However, other countries such as Europe are likely to register second largest market due to the presence of prominent players in the region for instance, Porsche, AUDI, Volkswagen, and BMW. The key players operating in the global automotive rare view mirror market are Magna International, Inc., Gentex Corporation, Valeo and Continental AG. The manufacturers are focusing towards collaboration to invest in research and development activities to produce innovative product to gain prominence in the global market. This report on the global automotive rear view mirror market aspires to serve as a credible business tool for targeted audiences such as the manufacturers of automotive rear-view mirror, automotive component suppliers, automotive original equipment manufacturers (OEMs), industry associations and other driver assistance systems manufacturers, and the end users of the automotive industry. The report provides in-depth assessment of every driver or restraint, catches the latest trends, segments it to represent the lucrativeness of smaller aspects, evaluates the potential of the market in various regions, and profiles some of the major companies in order to represent the competitive landscape. This research, done by a combination of experienced market research analysts, is a summation of primary and secondary research, conducted specifically to understand and arrive at trends before using them to forecast the expected revenue of the global automotive rear view mirror market. A major chunk of our research efforts depended on information collected from in-depth interviews and discussions with a number of experts of the industry as well as opinion leaders. On the other hand, the secondary research for the development of this report included study of company websites, press releases, annual reports, investor presentations, various international and national databases. The logic behind the secondary research was for the report to provide qualitative and quantitative estimated market size in terms of US$ Mn for each product, feature, and vehicle type. In addition to that, the report provides estimated market size in terms of US$ Mn for various geographic regions for the period 2017 to 2022, considering the macro and micro environmental factors. To evaluate the revenue generated from each product, the report has considered their launch date in the market, customer acceptance, price of the product, volume sales, trends in industry, and adoption rate across all the geographies. Based on product-wise, the global automotive rear view mirror market has been segmented into flat mirror, aspheric or wide angle mirror, convex mirror, two piece spotter mirror, and two piece tow mirror. Based on feature type, the automotive rear view mirror market has been bifurcated into heated, power adjusted, manual adjusted, auto dimming or electrochromatic, cross path detection, signal, and blind spot detection. On the basis of position, the market for automotive rear view mirror market has been categorized into side, dashboard, windshield, and interior roof. Vehicle type classification has been done according to compact passenger cars, premium passenger cars, mid-sized passenger cars, luxury passenger cars, light commercial vehicles, and heavy commercial vehicles. The report evaluates the potential of the automotive rear view mirror market in the regions of North America (The U.S., Canada), Europe (the U.K., Germany, France, Spain, Italy, and Nordic), Latin America (Brazil, Argentina, and Mexico), Asia Pacific except Japan (India, China, Malaysia, Singapore, Thailand, and Australia), and The Middle East & Africa (South Africa, GCC countries, Israel, and Nigeria). The size of the market and its forecasted valuations for each of these regions as well as the mentioned countries have been given for the period from 2017 to 2022, along with their independent CAGRs for the forecast period from 2017 to 2022, considering 2016 as the base year. The research study also covers the competitive scenario in these regions. Some of the key companies holding a position of strength in the global automotive rear view mirror market are: Gentex Corporation, Murakami, Ficosa, Samvardhana Motherson, Magna International, Honda Lock Manufacturing, Ichikoh Industries Ltd., FLABEG, SL Corporation, Sakae Riken Kogyo Co., Ltd., Flabeg Automotive Holding GmbH, Valeo SA, Lumax Automotive Systems Ltd, Burco Inc., Continental AG, and Tokai Rika.